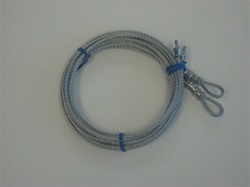 Heavy duty garage door cable set for standard lift 8' high garage doors 1/8" x 7 x 7 cable. Works with all Wayne Dalton, Clopay, Ideal, Raynor, Amarr, Windsor, Martin, C.H.I, Garaga, North Central, Overhead Door, Genie and most other 8' high garage doors utilizing a torsion spring system. (1) complete set of torsion 7 x 7 x 1/8" x 116"